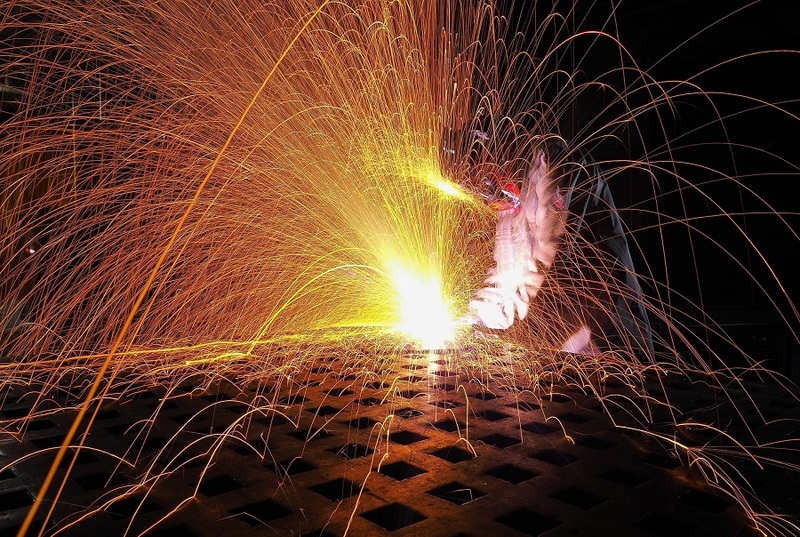 Why Is the Industrial Robot Revolution Just a Beginning? According to the IDC and its prospective study “FutureScape 2018“, the global industry will experience an installation of 2.6 million industrial robots by 2019. In other words, 60% of the largest companies in the world will be equipped with robots. The growth rates of robotics are not expected to weaken in the coming years. This is what IDC analysts think and this growth will be driven by industry, a traditional market for robotics. This will also new markets likes distribution and security. Welcome to the world of cobot or co-robot. Cobot collaborates physically with a human and shares the same workspace. After the industrial revolution that shifted a predominantly agrarian and artisanal society to a commercial and industrial society through the rail boom, now comes the robotic revolution. This is particularly due to the fall in prices of sensors and microprocessors, but also the fact that their ability to process information and to recognize the environment around them has developed strongly. They gradually stop being “simple” automatons and become “intelligent” robots. This change is not trivial, it reflects the fact that they are now able to evolve in contact with humans and therefore to collaborate with us. It’s common to say that the term “Robot” is attributed to the Czech writer Karel Čapek. The word was used for the first time to designate robots fictitious in the piece Rossum’s Universal Robots. The word would have been created by his brother Josef from the Czech word “robota” which means “servitude”. 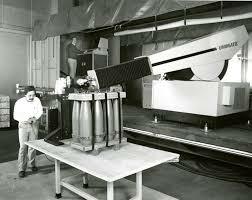 The Unimate was the very first industrial robot. Patented in 1954 (and then granted in 1961) by the American inventor George Devol, it’s the result of the foresight and business acumen of Joseph Engelberger, considered today as the Father of Robotics. In 1968, Marvin Minsky, the co-founder of the Massachusetts Institute of Technology’s AI laboratory, built his “tentacle arm,” as it moves like an octopus. This robotic device features 12 joints that give it a high level of flexibility. The arm was strong enough to lift a person off the ground. Many technological advances have been made such as the first “direct drive arm” in 1981 by Takeo Kanade or the famous IBM Deep Blue Computer that defeated world champion chess Garry Kasparov in 1997. What Are the Predictions for Industrial Robots? As we said in the introduction, 60% of the world’s largest companies will be equipped with robots by 2019. The race for productivity will push them towards more intelligent robots as well as more mobile and versatile robots. 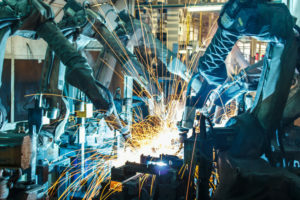 Among the key developments in the industrial robot market, industrial robots will gain in intelligence, integrating predictive functions, self-diagnosis but also shared learning and autonomous recognition. In addition, analysts predict the arrival of robotic agents that will coordinate the activities of all robots and increase their overall efficiency. The expected productivity gain would reach 30% better. On the other hand, these coming months will see mobile robots really modular, so potentially exploitable in several processes, according to the needs. These robots will be a significant progress compared to the current robotics where it’s very expensive to pass a robot from one workstation to another. The turnover of what is today a tiny niche market is expected to grow by 300% by 2020. Soon, we could see the arrival of drones launching robots. The drop in the cost of shipping a product would be of the order of 20% thanks to this robotization, which should lead many distributors to equip themselves. IDC estimates that 30% of the Top 100’s distributors will be equipped by 2020. The analysis points to a billion-dollar amount of robotics spending in sectors that do not yet use it. is the case of the world of energy (Oil & Gas and coal mining). To conclude, in order to accompany this wave of major equipment in companies, we should see appearing offers like Robot as a Service (Raas). 45% of deployments of mobile robots in companies will be carried out on such a rental mode by 2121. 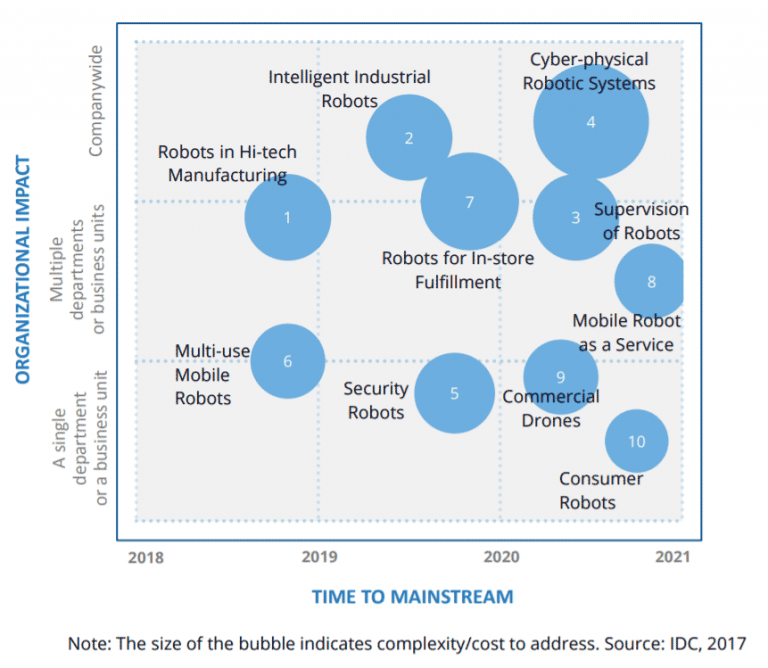 Source: “FutureScape IDC: Worldwide Robotics 2018 Predictions”, IDC, October 2017. Best marketplace for selling used machinery: how to choose? Want to write for the Exapro Hub?